The 2018 University of Arkansas Homecoming Celebration will take place from Oct. 14-20. All members of the University of Arkansas family are welcome to attend events during the week-long celebration. This year's theme is "A Place You Call Home." "With this theme, we hope to bring everyone back together, whether they are coming from out of state or just up I-40. to join in the tradition of Homecoming," said Kate Truitt, 2018 homecoming director. "We have all called the U of A home at some point and we hope this theme brings both current and past students together to celebrate the university." 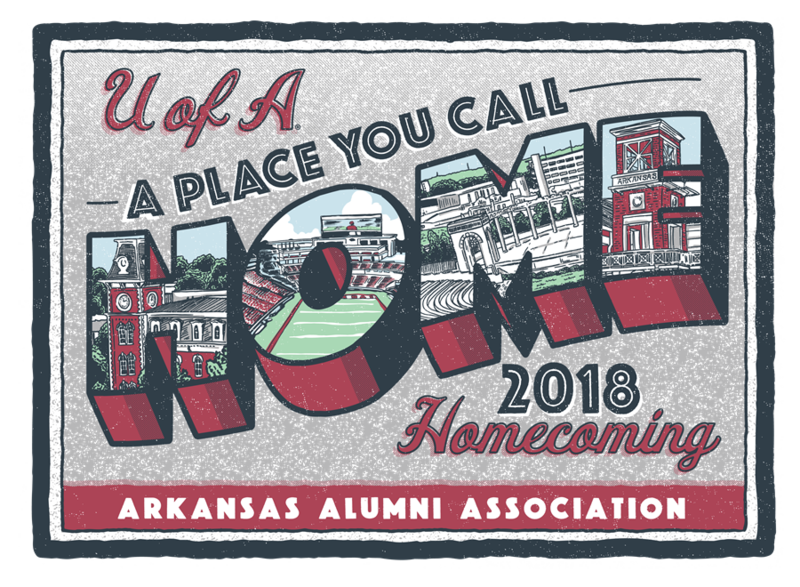 The Arkansas Alumni Association and Student Alumni Board are excited to welcome alumni back to campus, teach current students about the rich tradition of Homecoming, and connect with the University of Arkansas family. Activities will be held throughout the week leading up to the Homecoming game on Saturday, October 20. Cruise down Dickson Street as part of the oldest tradition in Homecoming. You can make a full float; ride in a truck with posters; or just dance down Dickson with your business! Everyone is welcome as we hope to engage the Northwest Arkansas community. Contact William Neely at wsneely@uark.edu for more information on how you can participate! Whether it is a banner on your office or a display on the lawn outside your building, help us decorate the community in Razorback Red & White. For more information on how you can get involved contact Amelia Chapman at agchapma@uark.edu for campus or Haley Stewart at hfstewar@uark.edu for community. Future Razorbacks ages 3-11 can enter into the Children's Coloring Contest. Get creative with this year's Homecoming logo. The coloring sheet can be found on the homecoming.uark.edu. Contact Emma Sullivan at eks006@uark.edu for more information. Show your University of Arkansas pride with an official Homecoming T-shirt! Orders will be managed by the Houndstooth Press and either shipped to your home address or dropped off on campus. More information is available through homecoming.uark.edu. Jane B. Gearhart Full Circle Food Pantry: Pack the Pantry. Donations can be made Oct. 8-20. Homecoming online auction is live! Bidding is open Oct. 12-26! Homecoming T-shirts, parade registration, coloring sheets, schedule of events and event details can be found at homecoming.uark.edu. If you have any questions, please contact the Arkansas Alumni Association at arkalum@uark.edu or 479-575-2801.